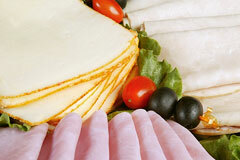 Soft, washed-rind cheeses are usually made from either raw or pasteurized cow's milk. Rennet and lactic ferments are added to the milk, curdling it. The curds are cut and stirred to speed the removal of the whey, then ladled into molds. The cheeses are usually shaped into flattened rounds or squares, but are sometimes produced in whimsical shapes such as hearts or fish. After setting, the cheeses are hand-salted, placed on boards, and often tinted with annatto, a natural coloring, which gives the rinds a characteristic reddish-orange hue. The cheeses are then ripened for up to 6 months. During this time, they are washed with salty brine which sometimes contains wine, beer, cider, or other alcohol. This process results in smooth, creamy, highly aromatic cheeses with thick rinds and assertive flavors — the original "stinky cheeses". Some of the most well-known soft, washed-rind cheeses include Muenster, Pont-l'Eveque, Livarot, and the infamous Limburger. Cistercian and Benedictine monks are responsible for the development of this type of cheese during the Middle Ages. Pont-l'Eveque and Muenster were invented around 1000 AD in France and Germany, respectively. Wood shipping boxes came into use in the 1800s, finally allowing these cheeses to be shipped for enjoyment throughout the world. Soft, washed-rind cheeses are served in a variety of ways. Wine and herb breads are traditional stand-bys, although beer is also a suitable accompaniment, its bitterness complementing the strength of the cheese. Some types are used in cooking as well, over potatoes or in egg dishes. On a cheese board, they will not go unnoticed. Gourmands appreciate subtle nuances of flavor beyond the initial powerful scent; in fact, some of these cheeses taste much milder than their pungent aroma would suggest. Fromagerie E. Graindorge is a cheesemaker in Normandy, France with the official AOC designation to produce the famous regional pont l'eveque and livarot cheeses. (In French). Isigny Ste. 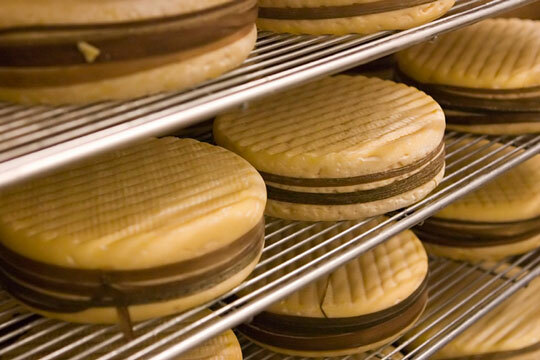 Mere is an AOC producer and distributor of French cheeses including livarot and pont l'eveque.